Model 110 3-point hitch post hole digger for Category 1 and 2 tractors. Fast post hole digging with convenient, safe operation from the tractor seat. Heavy duty gear box and driveline. Quick connect to 6 spline PTO. Heavy duty rating. Carbide, replaceable cutting edge. Spiral tip point included. 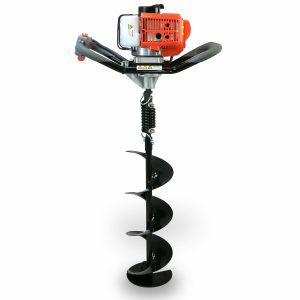 6″, 9″, 12″, 18″ and 24″ augers available.Top Link Pin Diameter: 1″. Left Arm Pin Diameter: 1 1/8″. Heavy duty piece of equipment. 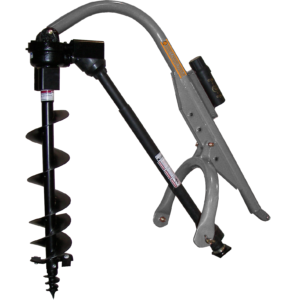 I use this on a Cat 2, 97HP tractor with 85HP PTO. The PHD is well designed, very effective, and much more cost effective than competitive products. The boom on my PHD had a bad weld and Dirty Hand Tools sent me a replacement very quickly. This is an excellent PHD and customer service is fantastic.